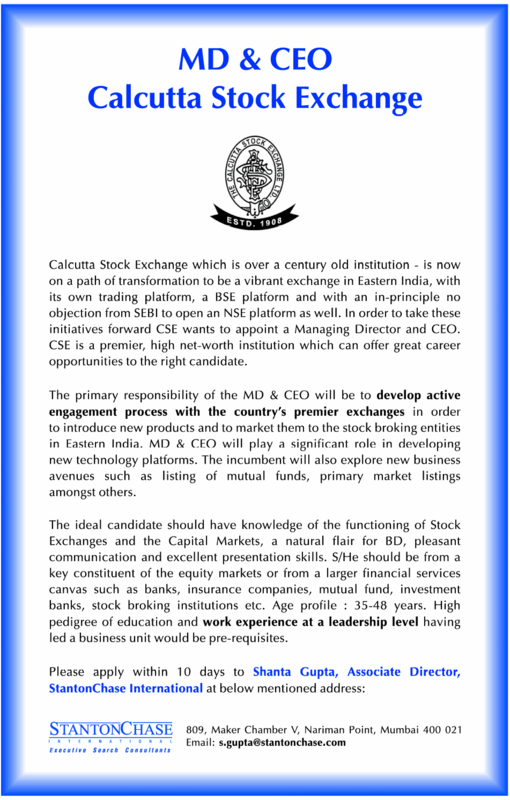 Calcutta Stock Exchange which is over a century old institution - is now on a path of transformation to be a vibrant exchange in Eastern India, with its own trading platform, a BSE platform and with an in-principle no objection from SEBI to open an NSE platform as well. 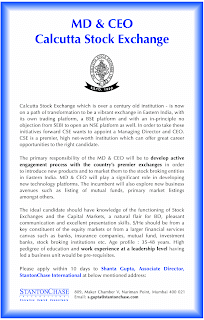 In order to take these initiatives forward CSE wants to appoint a Managing Director and CEO. CSE is a premier, high net-worth institution which can offer great career opportunities to the right candidate. The primary responsibility of the MD & CEO will be to develop active engagement process with the country's premier exchanges in order to introduce new products and to market them to the stock broking entities in Eastern India. MD & CEO will play a significant role in developing new technology platforms. The incumbent will also explore new business avenues such as listing of mutual funds, primary market listings amongst others. The ideal candidate should have knowledge of the functioning of Stock Exchanges and the Capital Markets, a natural flair for BD, pleasant communication and excellent presentation skills. S/He should be from a key constituent of the equity markets or from a larger financial services canvas such as banks, insurance companies, mutual fund, investment banks, stock broking institutions etc. Age profile : 35-48 years. High pedigree of education and work experience at a leadership level having led a business unit would be pre-requisites.